Six Sigma is a statistical methodology which involves multi-faceted business driven approach and the ability to improve processes, reduce costs and experience increase in profits. This improvement tool is extensively utilized in manufacturing, industrial and services industry. The purpose of this paper is to discover the implications and evaluate critical success factors for successful six sigma implementation in Pakistan and India. This research will assist in focusing on the critical success factors which has allowed industries in these two countries for having a successful implementation without investing on expensive consultation fee. The methodology adopted is evaluation of some real life case studies of six sigma implementation in various industries of Pakistan, India, Malaysia and Turkey. The analysis conducted revealed that this is a strategic-level cycle, which allows development of focused projects to generate maximum business advantage. Moreover at an operational-level applying Six Sigma and lean tools provides numerous benefits to fixed and variable supply chain improvements. The benefits which are obtained from such model are also discussed and it is concluded that management should conduct a thorough analysis in practice before implementing this technique on a particular department. However it is certain that cultural changes entail time and commitment before they are strongly implemented and practiced fully into the organization. The purpose of this paper is to evaluate the success and failure rates of Six Sigma implementation in Pakistan and India in comparison with some international countries. The end result will assist in making a decision that every company whether it is small, medium or large scale organization should go for Six Sigma or Lean Six Sigma implementation in their businesses. The six sigma technique which is a project-driven management approach aimed for improving the organization’s products, services, and processes by constantly reducing defects in the organization. It can be regarded as an improvement strategy which has the ability to deliver important business benefits in the longer run to all practitioner organizations (Guarraia, Carey, Corbett, & Neuhaus, 2008). However the debate is still underway which is in search of finding ways to have a successful model/procedure which can be applied to various fields of business. Six Sigma was originally introduced by Motorola, General Electric and Honeywell as an authoritative performance improvement tool (Pande, Neuman, & Cavanagh, 2006).The introduction of this technique has changed the face of modern industries today. It is basically a people focused management system that works by connecting all employees of a certain organization from top-to-bottom, in the form of a structured team (Thawani, 2002). It aims to persistently increase customer contentment by reducing real costs. The cost reduction is attained through attenuation in variation and focusing on the underlying reasons for poor quality or waste (Huesing, 2008). The Six Sigma implementation requires cost and efforts in terms of training human resource and reformulation of business processes. This research is carried out for finding sustainability factors which will motivate multinational companies for investing in Six Sigma. The Six Sigma is regarded as a business management methodology which is designed for finding and eliminating the underlying causes of defects which will eventually improve the output. Six Sigma also looks for variations which are hidden in a particular process and then remove all those excessive variations (Antony, 2010). Lean is an integrated approach which was developed by Toyota production system in Japan and their idea is to minimize waste between processes. Lean separates the value added process from the unnecessary steps which merely waste time and elongates a process from start to finish. In the year 2000 Michael George, a USA consultant proposed the idea of combining lean with six sigma as a single framework. He was of the opinion that this strategy will help in attaining better results with an integrated approach (George M. , 2002). This paper is aimed to find out “Six Sigma Success or Failure Experiences in Pakistan and India” for which we have conducted our research through online journals, articles and various case studies of companies which had implemented Six Sigma or are planning to implement in search of professionals who can assist them in applying this tool properly. This research paper is formulated with the core idea of having a critical review of real success or failure experiences of six sigma implementation in Pakistan and India. The observations were made on the basis of extensive literature review, case studies and real life instances. This phenomenon was followed for identifying the main factors which had made lean six sigma successful for small, medium and large scale enterprises. Eventually this research will assist other researchers to plan their direction from the recommendation offered by this study. Q1: What is the success and failure rate of six sigma implementation in Pakistan and India considering small, medium and large scale organizations? Q2: What can be the core success reasons for having a successful implementation of Lean Six Sigma in Pakistan and India? Q3: How efficiently and effectively are the other international industries especially from Malaysia are able to integrate lean six sigma in their industries? Q4: On the basis of national and international literature review which critical success factors have been deduced for having a successful implementation of Lean Six Sigma in Pakistani and Indian industries? Q5: Which particular sector (manufacturing, service etc.) will be able to yield maximum benefit from lean six sigma implementation? The approach which is taken for collecting data was mainly through case study observations which were made after analyzing various case studies and online research gathered from journals. The objectives were achieved by studying application of Six Sigma approach to various industries both in Pakistan and India which has give an insight of success or failure experiences. The objective of this research was to study the practical implementations of Six Sigma in Pakistan’s and India’s small, medium and large scale organizations. The basic philosophy of this research project is to put forward the positive approach towards Six Sigma implementation. However we will discuss both success and failures which are faced by these two countries during Six Sigma Implementation. The purpose of this paper was to present cases which depicts “Six Sigma Success or Failure Experiences in Pakistan and India – a comparison with, China etc. Moreover it has also discussed the business improvement methodology in relation to Six Sigma which has successfully applied across companies in Pakistan and India. H1: Management commitment and support is essential for having a successful implementation of Six Sigma and Lean in an organization. H2: Prioritizing projects & assessing the organization for readiness for having a change in an organization. H3: Following reward and recognition system is significant for having an ownership and cost accountability. H4: Monitoring and managing organization performance is essential for guiding business units in an effective manner. H5: The assessment of Small, Medium and Large Scale organization are significant for better Lean Six Sigma results. H6: Bridging the gap between Six Sigma and Lean Six Sigma together with sustainability and well-established governance. Six Sigma is a well-organized process which helps in selection of a particular direction. Moreover it allows in developing set of rules and procedures for delivering results with error minimization up to zero percent(Snee & Hoerl, 2003 ). This is a statistical term which measures how a particular process deviates from standard (Tang, Goh, Yam, & Yoap, 2007). The main idea which underlies behind Six Sigma is to measure how many defects a particular process has and then systematically find out ways to eliminate them which consequently attain end-result with zero defects (Summers, 2007). In order to achieve Six Sigma level of quality, a process is required to give output not more than 3.4 defects per million opportunities. An opportunity is regarded as a prospect for non-conformance which is not able to meet the required specifications (Larson, 2003). Six Sigma has recognized that business quality is regarded highest when the cost of providing a particular product or delivering a certain service, according to the customer requirements are at absolute lowest level. This level is defined not only for the producer but also for the consumer (Harry, Mann, Hodgins, Hulbert, & Lacke, 2011). 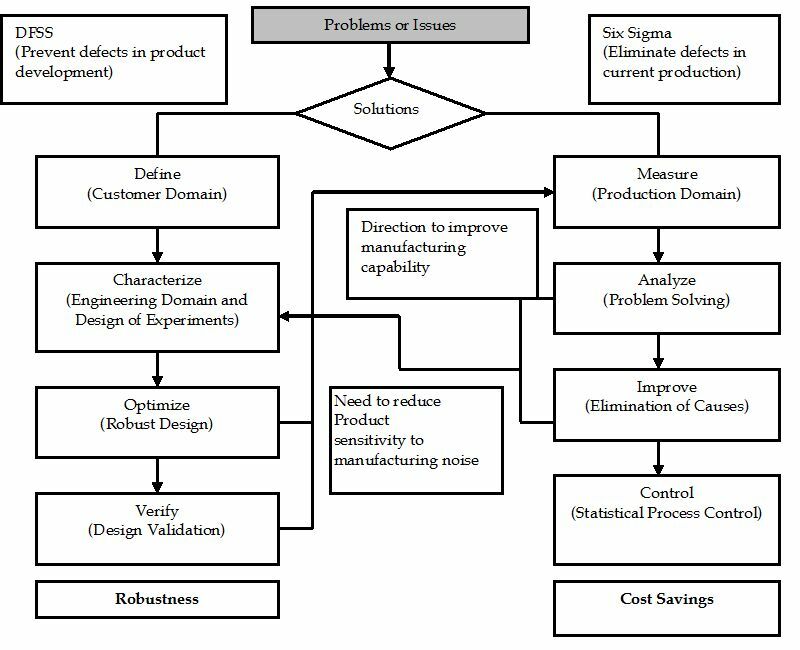 Similarly if Six Sigma is applied in a construction sector that this tools is not only focused on removing or eliminating the errors and making it defect free, instead it is always in search of ways for designing processes and products which can be applied at Six Sigma levels of performance keeping in view the strategic importance and the associated cost (Tennant, 2001). Six Sigma process improvement model is defined with the notion that quality of a product, service or process must be regarded as the responsibility of all. If a person is working in an enterprise then maintaining quality levels can never be regarded as the responsibility of some specific personnel like QA staff only. Quality Assurance department cannot be regarded as responsible for the failures of new products at the stage of Research & Development, secondly when some defective parts are found by any department such as Manufacturing, quality of Sales & Distribution services, the identified errors effects the budget making process (Kumara & Khandujaa, 2013). Whenever there is a company each person of a certain department is required to take the responsibility of their work. Lean Six Sigma is a technique which merges process speed with quality. In order to become an efficient and effective organization both in terms of business operations and processes it is required to have Lean and Six Sigma methodologies which will allow to execute every activity in an organized manner. It is worth mentioning that having one without the other will ultimately result in the lower process performance (Laureani, 2012). Lean is a process which primarily focuses on speed and then directs towards reducing the amount of time between activities, events and cycles. Initially if we are able to reduce the cycle then eventually the amount of time between activities, cycles or even the events can be reduced easily. The shorter the cycle time then ultimately we will be able to complete more cycles in a given amount of time. Lean has the capability to identify areas where process wastes and bottlenecks can be detected and then removed from the associated processes (Byrne, Lubowe, & Blitz, 2011). There are around eight types of wastes which can be removed from business processes for reducing costs and the time required for completing a particular process. Lean makes business processes to work rapidly but the problem of quality still remains. It does not make sense if the data or information collected is not of good quality. If the processes are just completed rapidly without having a proper check and balance then the complete environment will be filled with an error which requires rework at the end. At this stage there is a need of having Six Sigma business process management (Furterer, 2009). The lean practitioners are of the opinion that waste arises from the unnecessary steps which are created in the production process. Six Sigma proponents state that waste is resulted from the variation added within the processes (Guarraia, Carey, Corbett, & Neuhaus, 2008). Practically there is a truth which lies in both of these assertions hence both of these methodologies are applied jointly for improving the overall business performance (Taner, 2013). In the end it can be deduce that lean reduce wastes, improves process flow which eventually streamlines working operations to a certain level while Six Sigma reduces process variations which consequently optimizes current business operations. Six Sigma and ISO 9000 are two methods which are established for companies for increasing the quality of their final product. Six Sigma is regarded as a management philosophy which is directed towards solving defects which are causes for improving quality, while ISO 9000 is a set of international standards which are applied in a quality management system (James R. Persse, 2006 ). Six Sigma is implemented, authorized and controlled internally whereas an ISO 9000 is an organized set of requirements and guidelines, the certification of which may be obtained from external auditing firms (Adams, Gupta, & Wilson, 2003). ISO 9000 standards were developed in Europe which meant initially only for manufacturing processes but now this standard is being followed by various companies and industries. There are certain requirements which are essential for a company to fulfill in order to become an ISO certified company. These requirements include: monitoring individual processes, proper record keeping, scrutiny of all process outputs for the defects, corrective actions taken for removing defects and organizational commitment towards continual improvement of the quality system (Dirgo, 2005). Six Sigma is a quality management strategy which focuses on process improvement by removing the defects to less than .00034 percent, meaning for every million production attempts. Hence Six Sigma is directed on process improvement through output variation reduction; removing the causes for defects and variation in the final product which in turn increases process efficiency and generates profit. ISO 9000 is appropriate for companies which are in search of obtaining competitive advantage through the implementation of a quality management system (Knapp, 2009). An ISO 9000 certification is a proof that a particular company has been audited and helps in improving public perception of the company’s quality standards. However ISO 9000 certification does not guarantee that the company is capable enough to sell high-quality products, it only approves that correct and formal business processes are being followed by the company for the development of a product or service (Hoyle, 2009). China mobile is a Chinese owned telecommunication company which took a revolutionary step in 2011 for implementing Lean Six Sigma in their business operations. It is a big organization covering around 1500 employees and is the world’s largest phone operator having 650 million subscribers by January 2012. China Mobile implemented Lean Six Sigma in their Procurement, HR and Marketing divisions in which they devoted ten to thirteen employees completely with implementation of this new technique. According to one of our hypothesis management commitment and support is essential for having a successful implementation of Six Sigma and Lean in an organization. Hence this organization is able to achieve Six Sigma with the help of commitment, management and leadership. At this point, role of line managers is comprehensible who have been able to successfully implement Lean Six Sigma. The management was able to bring readiness of change in the organization through prioritizing projects and was applied in small phases which was then eventually applied to all other department which were willing to implement this new tool in their operations. Moreover the company started the reward and recognition system which also gave a boost to the employees and they focused more on project completion (Zhang, Irfan, Khattak, Abbas, Zhu, & Shah, 2012). Mobilink Pakistan is rated as the largest mobile phone service operator in Pakistan which has around 31.6 million subscribers. The company invested US$ 3.3 billion for implementing Lean Six Sigma Program in 2008 with 10 to 30 employees dedicated only for six sigma projects. Initially the company focused on Customer Care as their priority for Lean Six Sigma implementation but now other areas are also being targeted. The top management completely believed on the positive impacts of lean six sigma and finally as per our first hypothesis the company was able to save US $1.5 million which was a big achievement for a large scale project. Hence management commitment and support is essential for having a successful implementation of Six Sigma and Lean in an organization The company is still in the process of expanding Lean Six Sigma program to other departments. The attribute which made all these projects successful was the proper monitoring and organizational management which is essential for guiding business units in an effective manner. This feature is fully compatible with our fourth hypothesis. (Zhang, Irfan, Khattak, Abbas, Zhu, & Shah, 2012). The other Pakistani telecommunication company which made entry into Lean Six Sigma is Telenor. Initially the company’s management conducted an assessment of their organization whether it falls in medium or large scale organization. This is according to our fifth hypothesis a significant point of assessment for successful lean six sigma implementation. The company implemented Lean Six Sigma in 2006 and their core areas were HR, Customer Service, Marketing, Technology and Finance. They have devoted 100 employees to work directly on Lean Six Sigma Projects. The management introduced reward and recognition system which is an essential aspect according to our fourth hypothesis, for attaining lean six sigma perfection. On the basis of this revolutionary technique the company was able to eliminate 30% waste which consequently reduced 30% of their cost. Moreover the company was able to gain 10% in quality and 15% in process improvements (Zhang, Irfan, Khattak, Abbas, Zhu, & Shah, 2012). Pakistan International Airlines (PIA) observed that they were experiencing problems and their engines have started declining. Hence they took an initiative to introduce Lean Six Sigma in their processes. Their objective was to reduce the cycle time from 25 days to average 15 days and bring the curtail value lower to 80%. The implemented model allowed the company to stay efficient which further reduced their day to day activities. Although the company was following six sigma in their business operation but still there was something which was missing from their system. Hence the management decided to implement Lean Six Sigma in their processes which will not only reduce errors present in the system but it will also remove the wastage or redundant steps occurring in the system. This is in accordance with our sixth hypothesis and the company was able to experience a change. According to the CEO of PIA they were able to comprehend the advantages of Six Sigma which further reduced the material wastage and improved their supply chain activities which lead to overall cost reduction (AlSagheer & Mohammed, 2011). Pakistan State Oil (PSO) was also thinking on same lines of reducing errors and increasing company profits. Hence the management of PSO also decided to introduce Six Sigma in their business operations. As per our first hypothesis, the top management was fully committed with their decision and they gave their full support for successful implementation of Lean Six Sigma. As per COO of Pakistan State Oil they were able to reduce their our effective time to market which further increased their interest in this model implementation to other areas of the business. The company first applied this technique in parts for assessing its validity and results which is totally in line with our second hypothesis prioritizing projects and conducting organization assessment for experience a readiness of change (AlSagheer & Mohammed, 2011). Tate Chemicals is a subsidiary of Tata Pvt Ltd. which is now turned into a global business entity. The company is focused towards manufacturing and delivery of chemicals, fertilizers, agricultural services and other food additives. Tata Chemicals is rated as India’s top food brand for more than five years. The management of this group decided to implement Lean Six Sigma as a common business language which will allow them to obtain high performance. Full support and commitment was shown by the top management which is a core point according to our first hypothesis. Moreover the introduction of this technique will also allow them to improve their internal processes and build their decision making. Reward and recognition system was introduced which created directions for employees to work in an efficient manner. More significantly it laid the foundation for developing future leaders across the organization. This is in accordance with our third hypothesis which was also combined with monitoring and managing organizational performance with the tools applied during Lean Six Sigma implementation (Grichnik, Winkler, & Rothfeder, 2008 ). Another renowned brand Whirlpool also investigated Six Sigma and decided to start with this initiate in 1997 which involves a blend of methodologies. Soon the management of the company decided to use a blend of two technologies, Six Sigma and Lean for removing the inefficiencies, redundancy and other associated errors. The introduction of Whirlpool allowed the company to save $175 million in the first year and also achieved operational excellence by reducing the cycle times. All this when combined produced increased quality and high productivity (Evans & Lindsay, 2011). Maytag from India also initiated the step of implementing Lean Six Sigma in their business operations. The introduction of Lean Six Sigma improved the business efficiency which resulted in cost reduction. First the assessment of the complete organization was done which is essential for achieving best lean six sigma results. This is in accordance with our fifth hypothesis and then the gap was bridged between six sigma and lean together with sustainability and well-established governance. Lean Six Sigma reorganized the workflow and the production cost was also cut down by 55% which eventually allowed the company to save $25 million. This was all achieved through prioritizing projects and after conducting a proper assessment as per our second hypothesis (Martin, 2007). The facts which have been presented by (Mehdi, Ahmed, & Rasheed, 2007) represents the successful implementation of Six Sigma and DMAIC projects which increases productivity, and profit margins, and above all reduces errors. These results can definitely be regarded as key indicators for any industry to follow Six Sigma Implementation. According to (Sambhe & Dalu, 2011) thee is very little research available about automotive sector and the study also reveals that 25.64% of medium scale automobile sector has successfully implemented Six Sigma. Other automobile industries are also spending time and effort on the integration of quality management strategies in their business. Further it has been found that Six Sigma can be linked with rewarding employees or giving them recognition will encourage them in improving self satisfaction and their motivation level will also increase. In this way expensive consultation charges will also be saved through motivated and trained employees who will be willing to join in-house training sessions. As per (Mehdi, Ahmed, & Rasheed, 2007) the application of six-sigma in SSI assisted them in improve Z-bench Sigma level from 2.21 sigma to5.64 sigma and cost saving of 0.01929 million/annum. The systematic integration of Six Sigma tools and procedures is regarded as a challenge but this technique is proven definite which has reduced expenses, cost of poor quality and the concerning labor expenses. According to the findings of (Knowles, Whicker, Femat, & Canales, 2005) six sigma provides a thinking pattern for redefining the present approaches towards supply chain improvement. In such scenarios Six Sigma cannot be applied directly but it can be adjusted with variations for eliminating the waste and non-valued added activities. Six Sigma can be combined with some other tools which will link error reduction to storage strategy which will provide results of waste and variation reduction. The findings obtained from (Taner, 2013) concluded that the majority (97.18%) of the large-scale Turkish construction companies have successfully implemented ISO. However, it is still difficult for them to integrate Six Sigma properly in their operational activities. Undoubtedly, Six Sigma can help Turkish large-scale construction companies to maintain the highest quality of quality. First it is required to integrate the existing management procedures with Six Sigma by controlling variation with the help of its tools such as DOE (Design of Experiments), regression, correlation and hypothesis testing. On the basis of cases discussed above, it is evident that management commitment and support is extremely essential for having a successful implementation of Lean Six Sigma in an enterprise. The organizations which are in search of continuous improvement programs always welcome transformations and good governance. First the management should check the temperature of the organization before bringing any major change. Secondly a clear distinction must be made between leaders and managers and upgrade their communication plan with employees working at various levels. Once the proper emotional tone is generated then it’s only a few steps away to have Lean Six Sigma. Companies both at local and international level, which has been successful in implementing Six Sigma in their organizations, know the importance of prioritizing projects. They know how to assess the organization for readiness which will direct the path of change in an organization. The goal is to recognize when the selection of a particular lever will make biggest impact business priorities. The best technique for making this selection is performing a benefit/effort analysis and then defining and setting the scope of the project. The management must line up their behaviors, protocols and rewards across the business units. The morale of employees must be boosted by offering rewards and following a proper recognition system which will be significant for having an ownership and cost accountability. The ideas coming from all levels must be comprehended and given due importance. All those organizations which have been successful in true implementation of Lean Six Sigma are successful due to proper monitoring and direction provided to them. Leaders who run an organization are able to yield maximum benefits which allow senior leadership for understanding the programs running in an organization. Hence monitoring and managing organization performance is essential for guiding business units in an effective manner. For establishing a system which takes ownership at macro-level view assesses internal and distributed processes. The boundaries must be clearly defined, identified, and responsibility must be assigned for each segment, and interpret the specific responsibilities for those roles. Hence the assessment of Small Scale Organization (SSO), Medium Scale Organization (MSO) and Large Scale organization (LSO) are significant for better Lean Six Sigma results. Managers and Leaders are responsible for bridging the gap between Six Sigma and Lean Six Sigma together with sustainability and well-established governance. If a certain company is not able to truly recognize the distinction and clarity between these two then the transformation would be a failure. Due to limited time constraints and the number of available real life cases of India and Pakistan the research was confined at some points. However it is ascertained to discuss two to three different industries who have implemented Six Sigma successfully in their organizations. It was not possible to conduct on-site analysis of the processes which are being followed in industries. Again this study can be extended to include various other industries and compare the results with other international companies who are working with Six Sigma and other prominent tools. This research and extensive analysis based on the implementation of six sigma in Indian and Pakistani companies have provided a framework. On the basis of this direction other similar companies can also participate in this race and experiment a new tools and techniques in business. Six Sigma has already come forward as one of the most effectual business strategies in the large organizations, internationally. From the time of its conception at Motorola and GE, many success stories were registered by a number of multinationals. India is one of the leading developing country who has recognized the importance and significance of Six Sigma. It has provided a breakthrough for Pakistani industries also, as they can also follow the same model and make some significant changes according to their environment. This can assist other industries, who have yet not experimented with Six Sigma, to have a clear focus regarding their expectations from this improvement drive. All in all it is a great tool which will reduce the scrap rate, improve sales and also the image of the company. Six Sigma is primarily used as a tool and whenever any business integrates it into their processes it is bound to gain benefit. After combining this technique with lean methodology it is regarded as one of the key initiates for improving the management process than jut being remembered. Lean Six Sigma does not just pinpoint and count defects and errors, it presents real solutions and practices to existing management for yielding results. Various approaches are being applied by every industry for improving overall business performance and integration of Lean Six Sigma is regarded as a priority. Hence it is managements responsibility to ensure the long term sustainability of six sigma and lean for their organizations. This can only be obtained after analyzing and accepting the strength and weaknesses of both methods individually and in a combined form and then proceed towards proper utilization of six sigma principles, concepts and tools. Adams, C., Gupta, P., & Wilson, C. (2003). Six Sigma Deployment. Routledge. AlSagheer, A., & Mohammed, H. B. (2011). Six Sigma For Sustainability In Multinational Organizations. Journal of Business Case Studies , 7-15. Ansari, A., Lockwood, D., Thies, E., Modarress, B., & Nino, J. (2008). Application of Six-Sigma in finance: a case study. Journal of Case Research in Business and Economics , 1-13. Antony, P. J., & Kumar, D. M. (2012). Lean Six Sigma: Research and Practice. Bookboon. Aruleswaran, A. (2010). Changing With Lean Six Sigma. Changing with Lean Six Sigma. Breyfogle, F. W., Cupello, J. M., & Meadows, B. (2000). Managing Six Sigma: A Practical Guide to Understanding, Assessing, and Implementing the Strategy That Yields Bottom-Line Success. John Wiley & Sons. Burton, T. T., & Sams, J. L. (2005). Six Sigma for Small and Mid-sized Organizations: Success Through Scaleable Deployment. J. Ross Publishing. Byrne, G., Lubowe, D., & Blitz, A. (2011). Driving operational innovation using Lean Six Sigma. Creveling, C. M., Slutsky, J., & Antis, D. (2003). Design for Six Sigma in Technology and Product Development. Prentice Hall Professional. Darshak A. Desai, M. P. (2010). Six Sigma implementation barriers in Indian industries – survey results and case studies. Int. J. of Business Excellence , 142 – 162. Dirgo, R. (2005). Look Forward Beyond Lean and Six Sigma: A Self-perpetuating Enterprise Improvement Method. J. Ross Publishing. Evans, J. R., & Lindsay, W. M. (2011). Managing for Quality and Performance Excellence. Cengage Learning. Furterer, S. L. (2009). Lean Six Sigma in Service: Applications and Case Studies. CRC Press. George, M. (2002). Lean Six Sigma : Combining Six Sigma Quality with Lean Production Speed: Combining Six Sigma Quality with Lean Production Speed. McGraw Hill Professional. George, M. O. (2010). The Lean Six Sigma Guide to Doing More With Less: Cut Costs, Reduce Waste, and Lower Your Overhead. John Wiley & Sons. Grichnik, K., Winkler, C., & Rothfeder, J. (2008 ). Make or Break : How Manufacturers Can Leap from Decline to Revitalization: How Manufacturers Can Leap from Decline to Revitalization. McGraw Hill Professional. Guarraia, P., Carey, G., Corbett, A., & Neuhaus, K. (2008). How to get the most from Lean Six Sigma. Harry, M. J., Mann, P. S., Hodgins, O. C., Hulbert, R. L., & Lacke, C. J. (2011 ). Practitioner’s Guide to Statistics and Lean Six Sigma for Process Improvements. John Wiley & Sons. Hoyle, D. (2009). ISO 9000 Quality Systems Handbook – Updated for the ISO 9001:2008 Standard. Routledge. Huesing, T. (2008). Six Sigma Through the Years. James R. Persse, P. (2006 ). Process Improvement Essentials: CMMI, Six Sigma, and ISO 9001. O’Reilly Media, Inc.,. Jr., J. M. (2002). Six Sigma Quality for Business and Manufacture. Elsevier. Knapp, D. (2009). A Guide to Help Desk Concepts. Cengage Learning. Knowles, G., Whicker, L., Femat, J. H., & Canales, F. D. (2005). A conceptual model for the application of Six Sigma methodologies to supply chain improvement. International Journal of Logistics: Research and Applications , 51-65. Kokkranikal, J., Kosgi, J. A., & Losekoot, E. (2012). Barriers and challengesin the application of Six Sigmain the hospitality industry. International Journal of Productivityand Performance Management , 317-322. Kumara, V., & Khandujaa, R. (2013). Application of Six-Sigma Methodology in SSI: A Case Study. International Journal of Current Engineering and Technology , 971-976. Kwak, Y. H., & Anbarib, F. T. (2006). Beneﬁts, obstacles, and future of six sigma approach. Technovation , 708–715. Larson, A. (2003). Demystifying Six Sigma: A Company-wide Approach to Continuous Improvement. AMACOM Div American Mgmt Assn. Martin, J. W. (2007). Operational Excellence: Using Lean Six Sigma to Translate Customer Value through Global Supply Chains. CRC Press. Mehdi, M. A., Ahmed, N., & Rasheed, T. u. (2007). Six Sigma Implementation in Manufacturing Organization. Technical Journal , 58-63. SAMBHE, R. U., & DALU, D. R. (2011). Evaluating Six Sigma Implementation in Medium Scale Indian Automotive Enterprises. International Journal of Engineering Science and Technology (IJEST) , 1790-1796. Snee, R. D., & Hoerl, R. W. (2003 ). Leading Six Sigma: A Step-by-step Guide Based on Experience with GE and Other Six Sigma Companies. FT Press. Summers, D. C. (2007). Six Sigma: Basic Tools and Techniques. Pearson/Prentice Hall. Taner, M. T. (2012). A Feasibility Study for Six Sigma Implementation in Turkish Textile SMEs. South East European Journal of Economics and Business , 63-71. Taner, M. T. (2013). Critical Success Factors for Six Sigma Implementation in Large-scale Turkish Construction Companies. International Review of Management and Marketing , 212-225. Tang, L. C., Goh, T. N., Yam, H. S., & Yoap, T. (2007). Six Sigma: Advanced Tools for Black Belts and Master Black Belts. John Wiley & Sons. Tennant, G. (2002). Design for Six Sigma: Launching New Products and Services Without Failure. Gower Publishing, Ltd.
Tennant, G. (2001). Six Sigma: SPC and TQM in Manufacturing and Services. Gower Publishing, Ltd.
Thawani, S. (2002). Six Sigma Quality in Service Industry. Vanzant-Stern, T. (2012). Lean Six Sigm: International Standards and Global Guidelines. Fultus Corporation. Yang, C.-C. (2010). Six sigma and Total Quality Management. Zhang, Q., Irfan, M., Khattak, M. A., Abbas, J., Zhu, X., & Shah, M. S. (2012). Critical Success Factors for Successful Lean Six Sigma Implementation in Pakistan. Interdisciplinary Journal of Contemporary Research in Business , 117-124. Thanks for this wonderful six sigma article. I did not know that six sigma originated and was founded by Motorola. Please post similar assignments.